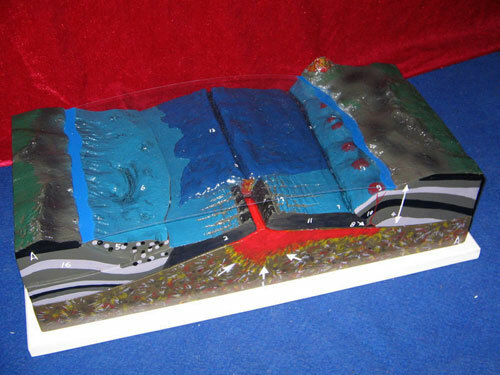 Section illustrating the structure of the ocean's floor. 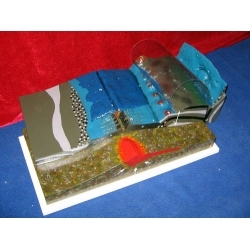 The model mainly demonstrates the processes of the formation and distinction of the ocean floor. Due to the intrusion of the new substances from the asthemosphere underneath the edges of the lithosphere, these substances from the mantle push the earth crust to the sides, causing the renewing the the ocean floor. Because the floor is being pushed to the sides, the marine trench and island arc are close to each other and both dive into the mantle when reach to the land. Thus, the formation and distinction of the floor become balanced. The ocean floor gets renewed every 0.2~0.3 billion years. formation of ocean ridge: rising and cooling of the mantle substances. marine trench: ocean floor diving into the mantle. island arc (island arc chain), ocean mountain: formed when the land crust and ocean crust crash. 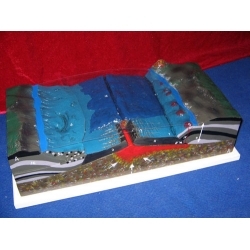 earth crust, mantle, Mohorovicic interface, silicon aluminum layer, silicon magnesium layer. features of the age of ocean crust. features of the structures of land crust and ocean crust.